Despite rain virtually every day since December, we drove to the 2001 Paul Reunion with some hope since blue sky peaked out periodically as we made our way south. Stewart, mom & I took one car while Glenn drove himself since he had to return Saturday to work Sunday. Doug & Manasi finished up some midterms and hit the road a little later in the day. We had loaned them our second car and found out when we dropped it off Thursday that it was Manasi's 21st birthday! How they can keep such secrets I'll never know. Unfortunately, it did cloud up and rain a bit on the drive down but was not raining when we turned north on 2341 toward the lodge. What a sight! 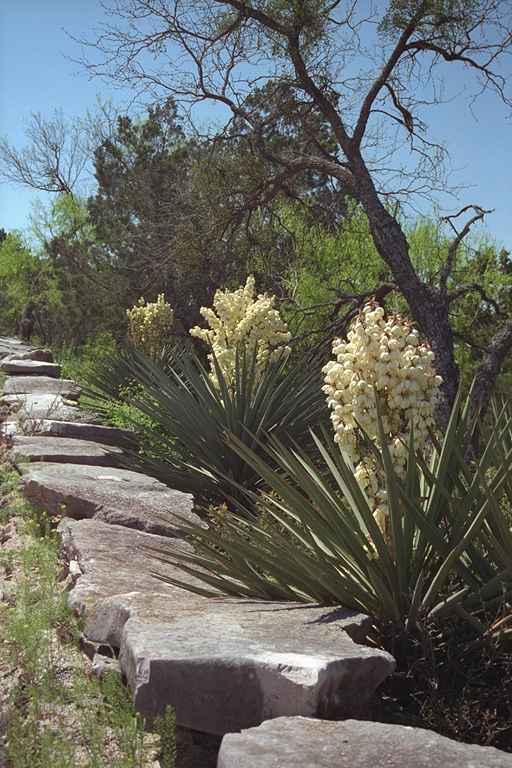 The bluebonnets were in full swing, interspersed with the vibrant red of the Indian paintbrushes on a backdrop of prickly pear cactus and granite outcroppings, and as we neared the bluffs across the creek crossing, we found the hillside spotted white where hundreds of yucca plants were blooming. We arrived at the Canyon of the Eagles lodge around 2pm, and found Glenn and the Webbs (Trina & Steve, Russell, Melanie and Brandi) shortly thereafter. 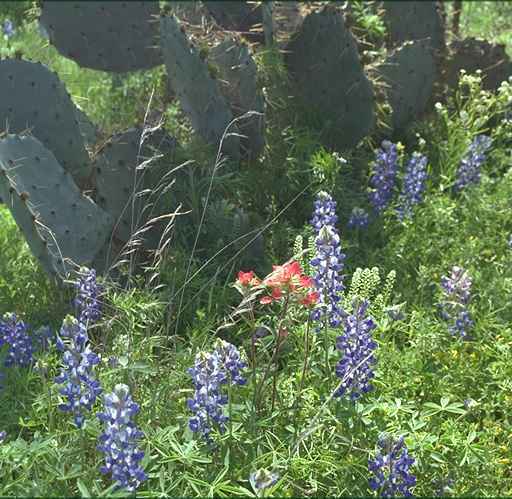 Despite puddles around the place, the lodge was wonderful in its rustic Texan way. 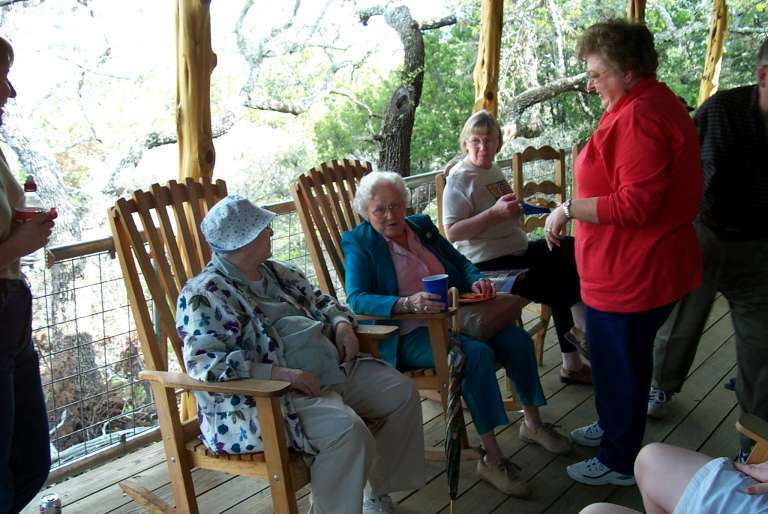 The cottages were roomy and each had porches with rocking chairs. 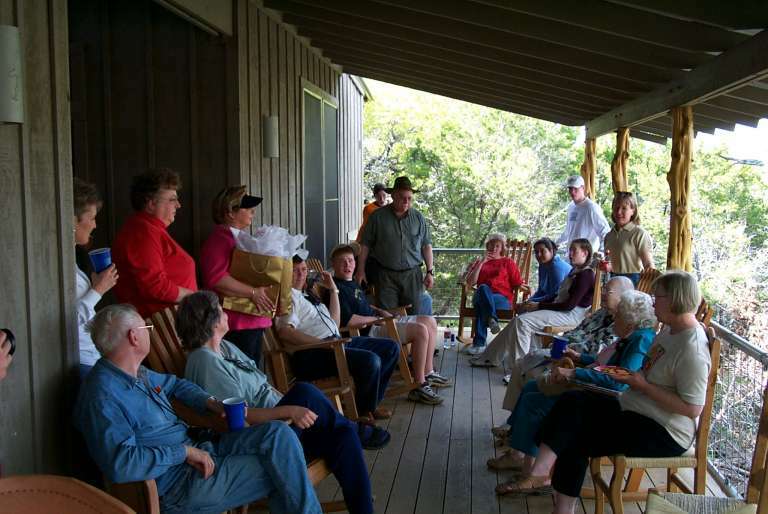 There was a game & TV room, and lots of rockers around the main lodge building so as more folks gathered, they grouped on the porches and started catching up with each other. Brandi & I headed down the trail to the boat dock for a short hike. She said she had never been in the country before and was intrigued by the trail, the lake, and the ducks that came up so close that we could see their little feet paddling underneath them. Back up to the lodge, we found everyone checking in. Bill & Linda, Pete & Betty, David & Susan, Ken & Ruth Ann with Paul & Caydee, Barbara (Jim had to work but would be coming the next day). Jack & Betty and Doug & Manasi arrived little later and then, to our surprise, we discovered that Nell was actually going to be able to come. She had said she wouldn't be coming since Mel had just recently gone on oxygen and wasn't able to travel with it, but much pleading from around the family had caused her to find a way, so with Roger staying with Mel, and Marilyn picking her up at the airport in Austin, Nell joined us for dinner at the Canyon Restaurant that evening. 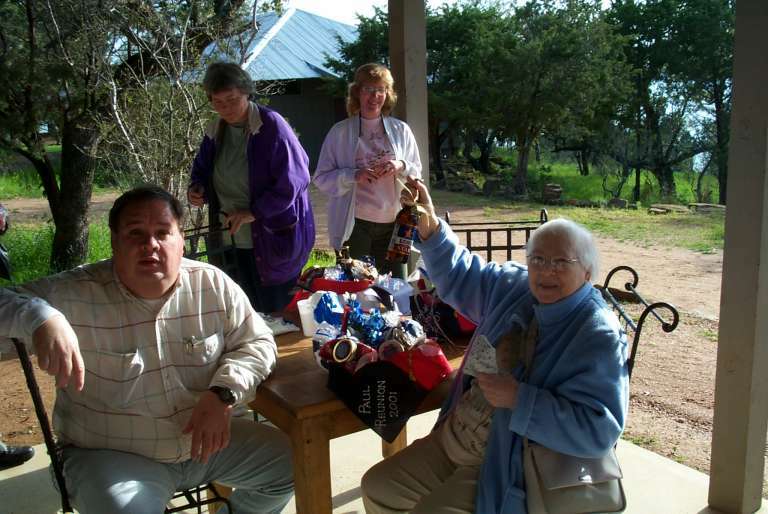 Betty and Ruth Ann and their family put together a wonderful basket of hand-made Texas momentos, including some dry barbeque rub, Texas flag handkerchiefs with the Paul Reunion written on them, some Jalapeno jelly, and a bottle of Lone Star beer that some people were glad to see! Dinner was buffet style in the restaurant overlooking the lake and it was great to have everyone together, catching up, meeting the cousins we hadn't had a chance to meet before, and listening for new stories especially from mom and Nell. Here are some pictures from dinner. The Matriarchs, Esther Cummings and Nell Kerr. 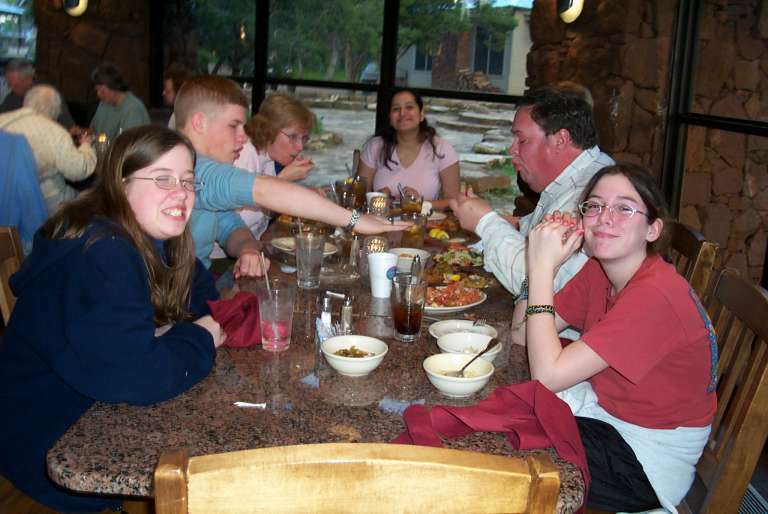 The Webbs, Melanie, Russell, Trina, Manasi (Doug's girlfriend), Doug (hidden by Steve), Steve, and Brandi. 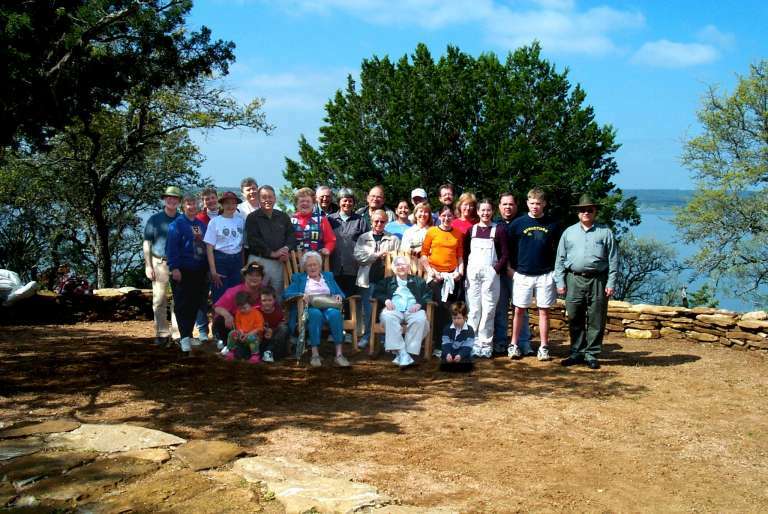 The Pauls and Dickensheets, Betty, Pete (partially hidden), Ruth Ann, Caydee, Ken, Barbara, and Paul. The Pauls and the Stangles, David and Susan, Betty and Jack. 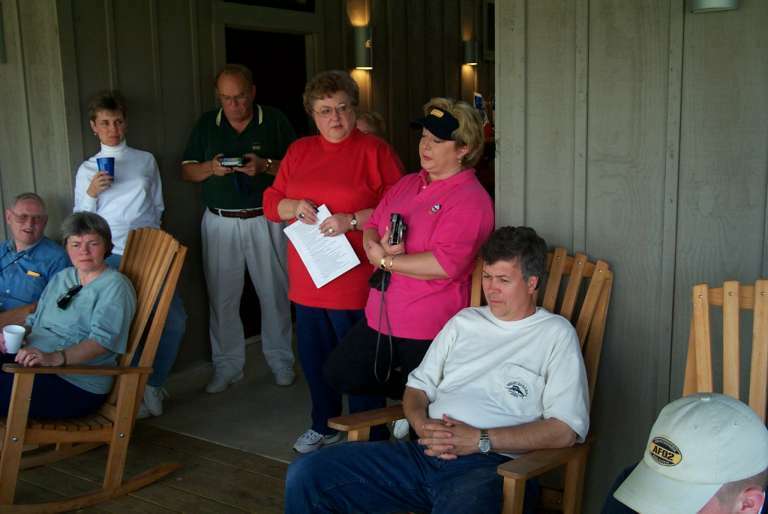 The Ramps, Bill and Linda, with Anne French, Esther Cummings, Nell Kerr, and Glenn Cummings. 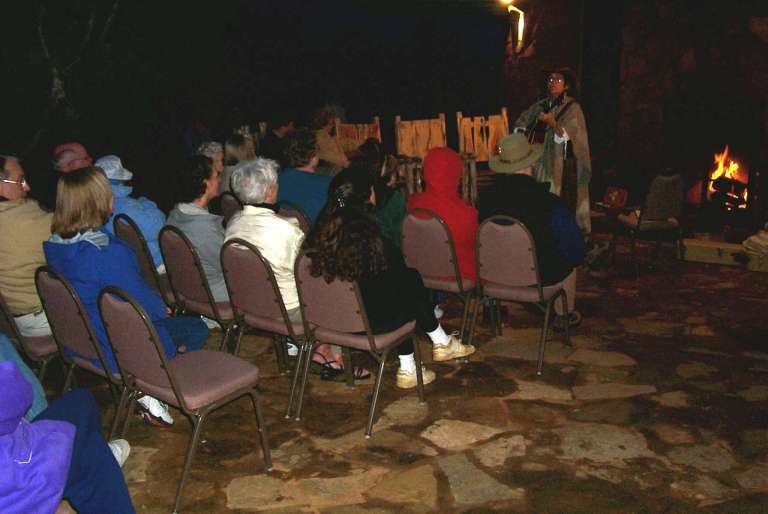 The lodge had a treat for us after dinner: a Western singer and yodeler, Jill Jones, set up in front of the big firelace outside the restaurant and we gathered in the chilly night air to hear her cowboy songs and stories. She often requested coyote howls from the crowd and although the kids were pretty good at it, I think David got the award for most enthusiastic howler. Saturday dawned miraculously sunny and warm. 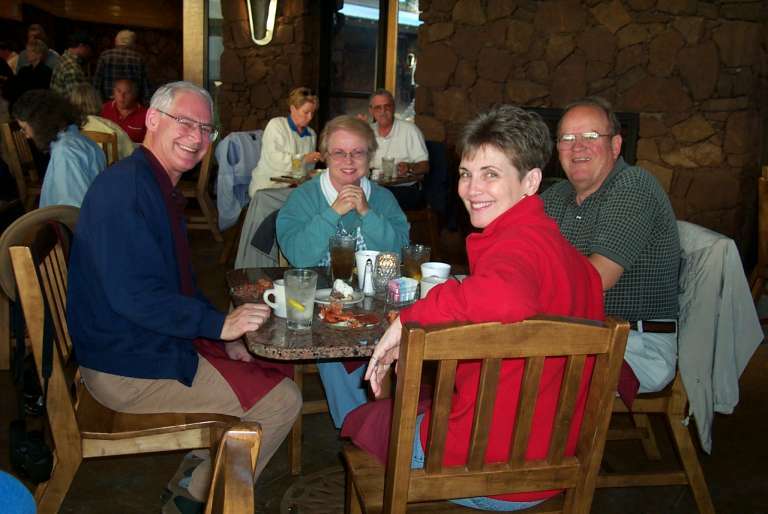 We gathered at the restaurant for breakfast and discussed the day's planned river cruise and social hour. Then we discovered we hadn't set up a time for a group photo. As the issue circulated, it seemed that morning was probably the most likely time to get it done, so we tried to get hold of everyone and herd them into Rattlesnake Point, a large clearing encircled by a stone wall with the lake making a nice backdrop. 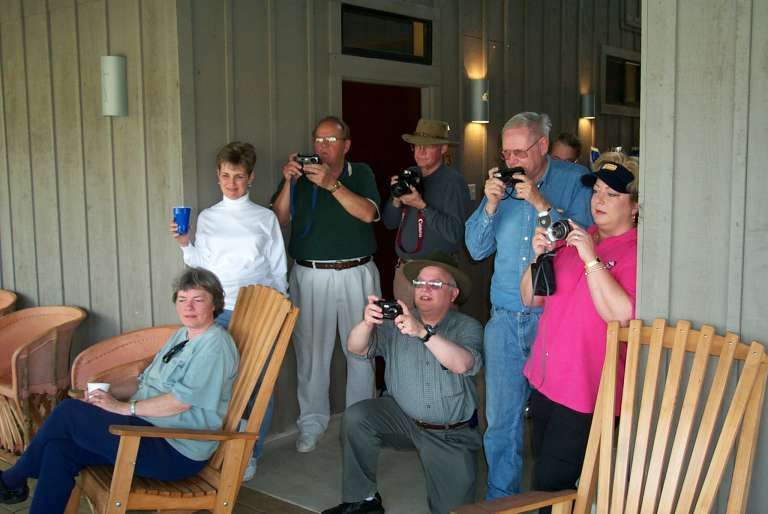 A lodge employee was kind enough to take our picture, so she was draped with cameras and made each one click and flash until she'd gotten through them all. And we were successful getting everyone into the picture, even if we did have to use a little technological help. Can you tell? Then it was down to the Park Store to get tickets for the River Cruise and box lunches. We boarded the 200-person boat about 11am and headed down the Colorado River. The water had been so low when mom & I had visited in September that the cruises had been cancelled but now it was at the highest it had been in several years. The crew tried to give a running dialogue of the sights but the sound system was pretty poor so you'll just have to go again to hear it. We took the opportunity to travel up and down the three levels of the boat, visit with folks, and take pictures. There were lots of Blue Herons, pelicans, seagulls and turtles sunning themselves tiered on logs. There were occasional sightings of goats running along the hillsides and one golden eagle (or osprey depending on who you talked to) who had a bad attitude toward the spectators and left quite the large calling card. 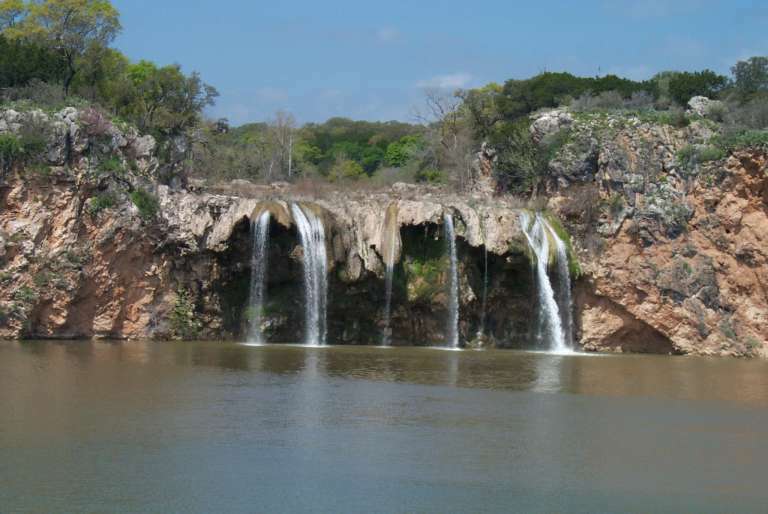 The highlight was Fall Creek Falls, which poured over a massive rocky ledge jutting out from the hillside. 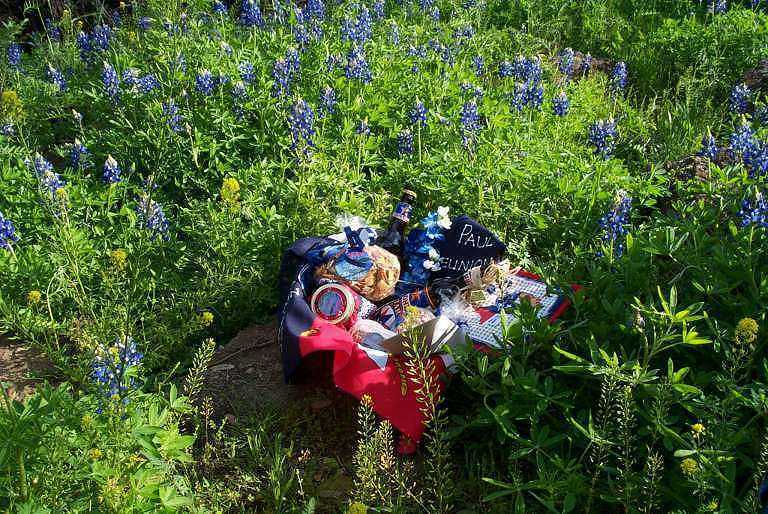 The temperatures were in the 70s, the sky was big and blue, and the comeraderie was just great. We enjoyed our box lunches and relaxed for the remainder of the cruise, some of us more relaxed than others. 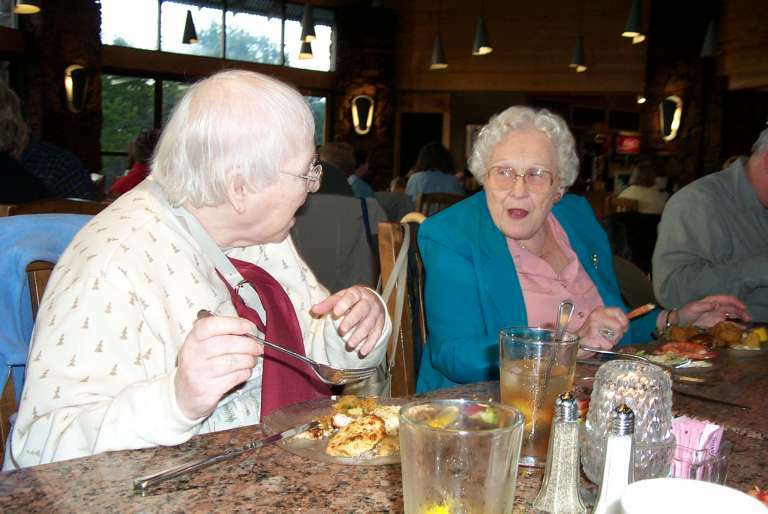 At 3pm, we got a special surprise, planned by Betty & Ruth Ann. They invited us all to their cottage where we found a spread stretched out on the long table in the dog run (hall way) in the middle of the cottage. 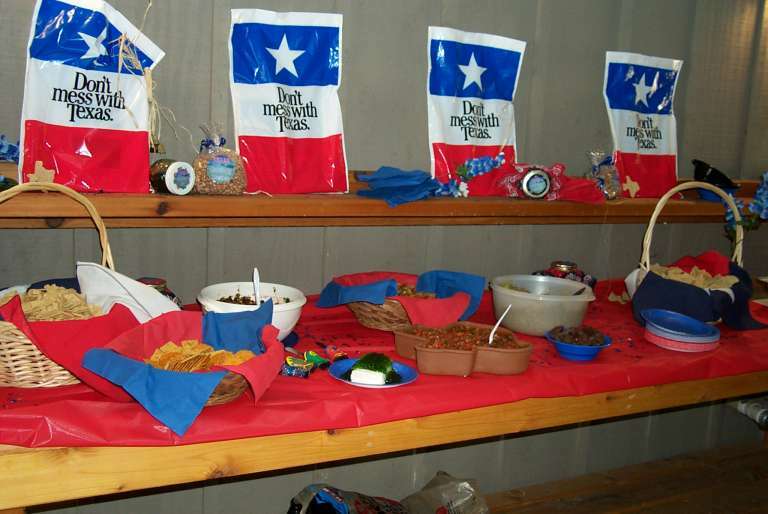 They had Texas shaped tortilla chips and homemade jalepeno jelly with cream cheese, black bean salsa, regular salsa, guacamole and beverages. It was amazing! 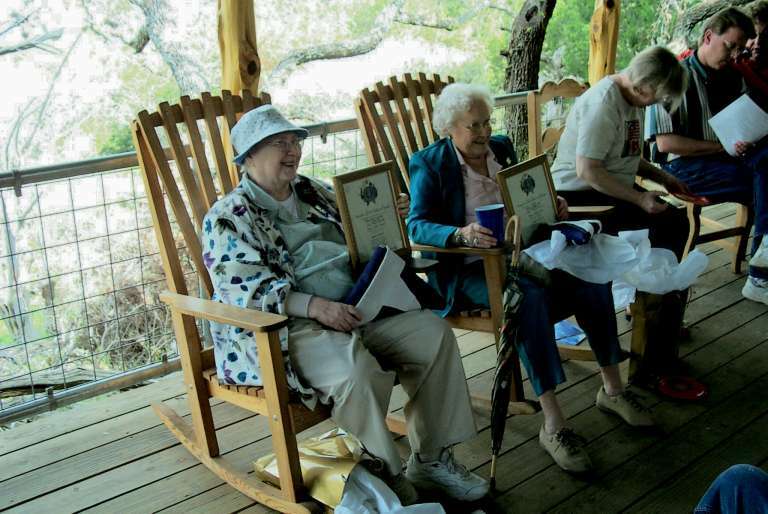 Then, with Esther and Nell seated in adjoining rocking chairs on the porch, Ruth Ann presented each with a Texas State Flag and a plaque describing how the flags had been flown over the Texas State Capitol in Austin earlier that week and were dedicated to Esther and Nell in honor of the Paul Family Reunion. It was a very touching moment and both were quite surprised and honored. The paparazzi swarmed as Esther and Nell accepted their prizes. The remainder of the late afternoon Stewart, Trina and I took advantage of some of the hiking trails in the park. 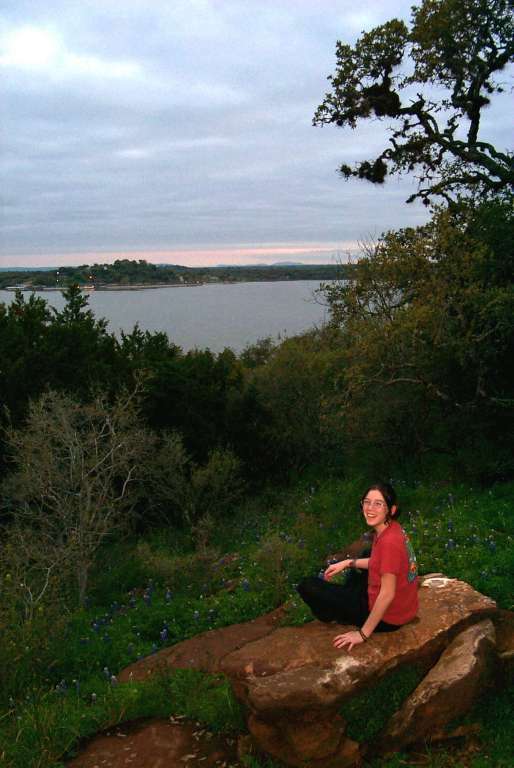 The silence was deafening, and the vista views were pure spring in the Texas Hill Country. Priceless. 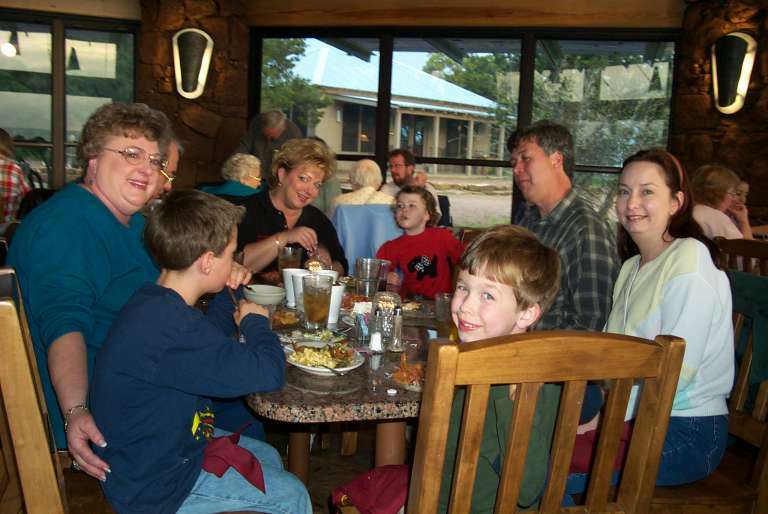 For dinner that evening, we made a caravan to the Highlander restaurant in Burnet. They were so understaffed due to last minute no-shows, so we had quite a wait for dinner, but at least we had scrounged up some wine and they had a salad bar to tide us over. We couldn't decide whether the Christmas decorations were cute, or just a sign they'd been understaffed for a long time. Manasi was a big help, gathering up dishes just like she worked there. (I wonder how her tips came out?) But the ribeye steaks were wonderful and the company was worth it. It got us together in a room of our own where we could hear each other. Esther had a great reminiscensce of her wedding at Purdue, and Nell got a chance to speak to the crowd when she rose to thank us all for coming. We all missed Mel, Jane & Rod, and routed cards to make sure they knew we were thinking of them. On an up note, twice Doug and Manasi narrowly missed hitting the deer that were in the road on the narrow, winding road to the restaurant. We were very glad they missed since they were in our car! Before the evening wrapped up, I distributed some pamphlets Donita had forwarded from a Colorado lodge as an option for the next reunion. We discussed time frames, and everyone agreed the end of June would work best, especially for those with children in school, and those who prefer that it not be snowing too hard. And, despite some asserting that they might not be around in two years, the vote was for the year 2003. So, you'll be hearing from Donita about the next reunion and I hope everyone and more will be able to attend. 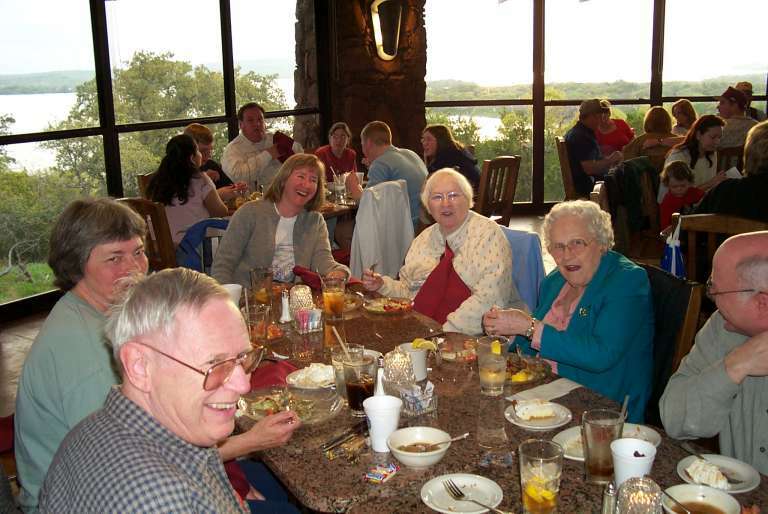 We concluded our stay with breakfast at the Canyon Restaurant and several small gatherings of goodbyes. 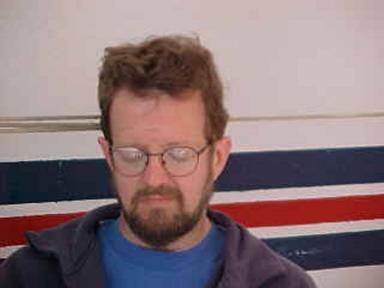 I'm already looking forward to the next one, so I'll see you in Colorado in late June, 2003!